With these routines we are going to get into the utmost effective specialization programs of which there have been many records kept. For the most part, these methods of acute specialization will work the muscles and the lifting movements to a peak of development and proficiency which beforehand would have been felt were completely impossible or out of the question of being attained by the average trainee. What we are going to be doing in this section of Chapter 5, is outline for you in the most intense situation of physical endeavors. This means that you will be narrowing in on your training goals and aspirations in order to “milk” from your body all the utmost potential as far as development and physical lifting abilities you are capable of. These techniques are by no means completely new or untried by other men before you; on the contrary, most men who are the champions of today and yesterday have tried these training methods at some prior time of their lifting life. These routines must cause an increase in size and strength, due to their severity and their specificity of nature. When you work only one or two movements per workout and those workouts are both voluminous and intense, with the brunt of the work strictly and thoroughly performed, you must gain in one way or another, due to the very nature of such an undertaking and the way in which the average person’s body will adjust to an overload of stress. This is especially true for the man with a very low energy level, who has trouble in formulating a routine which he can recuperate from, throughout the many years of his lifting career. For the man who is constantly complaining of being overtrained, these types of routines will do wonders for both his physical development and his all-over lifting potential. This does not mean that these routines will not also benefit us more toughened-up trainees, for we all can reap great amounts of benefit from this type of workout if we have the self-belief and the self-control to give these short, intense routines a chance to show us exactly what they can do. Therefore, it would be to all or our benefit to look over these suggested routines, no matter haw short and simple they may seem to us at first, for in the long run they will work only if we will work. This first specialized routine will be for the man who wishes to experiment with training for only one hour per day and using one exercise movement per training session. This will mean that each movement will have to be an all-around muscle group movement to stimulate the most available fibers of the largest muscle groups of the body. In this way, such short training will be most complete and result producing and in the long run, will develop the most muscle for the amount of work and time put into the training period of any type of training that I know of. By training five days per week and using only one movement per day, we must make sure that such choices will not cause muscle overlap and therefore become physically redundant, thereby leaving out certain muscle groups which would produce a lopsided physique and d decrease in all-around lifting power. Therefore, before undertaking this type of routine, be sure to know how to set up your schedule beforehand as to what to do and what not to include so that the entire body becomes stimulated to greater developmental heights during the course of a lifting week. This will allow not adequate recuperation although you will be training almost daily and also, it will develop for you an increase in all-around listing power. This will develop the capability of going just about as far as your particular potential will take you in the way of lifting proficiency. To stimulate additional muscle growth, it will be necessary to include in the future additional work for the aforementioned muscles in order to fully work them and reshape them, as it were, to greater development and shapeliness. But for the fellow who is primarily interested in all-around lifting proficiency and a well-developed rugged physique, this is the routine to follow. With the choice of these movements we have given the entire body quite a workout by the end of the week. For each of these movements I would suggest you choose one of the following set and repetition schedules. The reason I am giving you somewhat of a choice as to the number of sets and repetitions you will be using, is due to the complexity of the choices of exercise movements and the importance of your being able to choose the right schedule which will work best for your personal preferences as to how many sets and how many repetitions will work best for you. With such a short, daily exercise program to work with, it is important to choose the right balance of work. I would advise either that you perform each exercise for around ten sets of five to seven repetitions, with the first three or so sets as progressive warm-ups and the brunt of the work taking place from set four to set nine, and the final set or two being flushing sets with somewhat lighter weights. Another suggestion would be the following tried and proved effective repetition and set scheme: one set of ten, one set of eight, one set of six, and five sets of three reps using all weight possible. Finish up with two or three sets of five or so reps with somewhat lighter weight for complete flush. Finally, when feeling particularly energetic and strong, you could take a set or two for a warm-up and then progressively add to the weight of the bar until you are at close to 90% of your limit and try for three to five single attempts with this heavy weight, finishing up with a few sets of lighter poundages with higher reps.
All three of these suggestions will work for you on such an intense, short routine. In fact, one week you could use one schedule and the following week the other, and so on. It really is up to you in the final estimation as to how many sets and how many reps you choose to follow when working on such a course. They all have merit, if followed using intelligence and patience. You fellows who are always complaining about how little time you have to spend on your training will find that these schedules take very little time as compared to other routines that the majority of us trainees follow in our attempts at getting bigger and stronger. With such short workouts you should be able to recuperate quite easily and the result will be an increase in your training enthusiasm, less missed workouts, and a general increase in both lifting proficiency and in muscular development. The next type of specialization routine will be somewhat more complicated than the first example I used to demonstrate such training and the effects of such types of work. With this following routine, we will be training four or five days per week, with the average routine consisting of two movements per day. This way, you will be able to perform a more diversified amount of work each workout and in the long run, the all-around effects will be more predominant in muscle building and strength level increases. This is because of the coupling of two such movements each day. By coupling two movements daily, or almost daily, it is not necessary to train each and every day; in fact, it will be possible to cut down the number of training days each week to four. Also, with the coupling of two movements daily, you will be training a bit longer each day, but the total amount of work done weekly will remain approximately the same. This may mean the difference between success or failure depending upon the rate of recovery your body can acclimate itself to. Some men will find that two movements per day is just about right for best results. Others will prefer less training days per week but will prefer maybe three movements done on each of these days. Others, in the extreme other end of training energy levels, may find that one movement per day is just right to insure continued gains. So you see, in this section of this chapter, we will be discussing each of these types of personalized specialization routines, so as to give all of you a chance to try whatever kind of routine you may feel will be right for you. There is only one way to find out: you must experiment and see what will work and what will not work. This following routine is for the man who wishes to specialize on the pressing muscles of the upper body, but at the same time, wants to be sure that he is including enough work for the additional parts of the body so as to not lose anything previously developed in the past. In order to insure this not happening, you will have included on an almost daily basis, enough work for the additional muscle groups which will keep them in proper state of tone as the brunt of your workouts will be geared to developing additional size and strength in the pressing muscles of the body. What I would advise you to do in this case, is to work one pressing movement each training session, with one squatting movement on one day and one pulling or arm movement on the following training day. This way, the rest of the body is adequately stimulated. With this routine I would advise you to perform the following set and repetition schedule: for the majority of movements except the Bent Legged Deadlift, warm up for two or so sets and then move up to weight which you can handle for between three and five sets of four to six repetitions. After this, cool down with two or so sets of eight or so repetitions, with a somewhat lighter weight. For the deadlift, I recommend sets of three repetitions, working up to a maximum triple. This should develop more than enough power for the limit deadlifting. For the rest of the body, there is more than enough work to stimulate increases in muscle size and power. With continued application of this kind of training, you will realize a great increase in your pressing power from all angles and the rest of the body will not suffer in development or power because of the inclusion of additional work for these areas. This type of training can become most meaningful and enjoyable for you and many men enjoy this kind of training so much that they stay on these kinds of programs for the entire training year. For the man who has a greater ability to recuperate after strenuous training there are further methods of training which will stimulate even further rates of growth and development, due to the extent of their severity and complicated nature. With these types of workouts you would do all your pressing on one day, the whole amount of squatting on the following day, and finally, on the third training day you would follow a most complete routine to fully work the pulling muscles of the body. In this way, although you would be training six days per week, you will only be working each muscle group twice weekly, so that the entire workload would be evenly distributed throughout the entire body, with adequate rest between workouts. The severity of this routine will make it necessary that you do not try to stay on this routine for more than a month or so, unless you are one of those rare individuals who can thrive, or seem to do so, on such a great quantity of hard work. If such is the case, then by all means stay on this type of routine as long as you wish to. But for the majority of the rest of us, a month and a half of so would be long enough to stimulate correct training responses. As soon as one begins to feel somewhat drug out and less proficient at one’s workouts, it is then time to switch to a less severe amount of work until full recuperation is realized. If you cannot train on Sunday, then train from Monday through Saturday and take Sunday off. With this type of routine, there is a tremendous amount of stress placed on the physical and emotional parts of the mind and body, so be sure to realize this and take steps to deter physiological staleness, which may step in and force an unwanted layoff. A good idea would be to take a few extra naps throughout the day so as to make this excessive work more acceptable to the body and more easily recuperated from. Just as we must learn to creep before we can walk, so must we find our way through this kind of workout, slowly and with great hesitancy to overwork, since this would work against us, not for us. Rest assured, if enough care is taken to see to it that the correct kind of diet is followed throughout this entire training affair, the result we are seeking will make itself felt. All that is necessary is to barter our energy and see to it that we are properly fed and adequately rested. 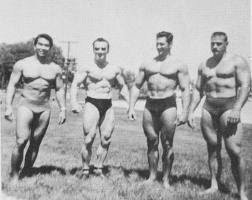 Another avenue of experimentation which has been proven most successful to the few men who have proved to be innovative enough to attempt such a unique incorporation of training schedules and exercise frequency would be where you will be working the entire body each and every workout. Then, after working extremely hard on the entire body, you rest until you feel that you have completed the amount of rest and then, and only then, do you take another workout. This means that some weeks you may be training three times per week and other weeks you will be training only two times per week. But in both cases, you will be sure to work more than enough to stimulate sufficient gains without the chance of under-recuperation or overtraining becoming a problem. This way, there are very little wasted training programs when on this type of routine. By limiting the amount of training periods each week, you can greatly magnify the amount of work done on each chosen exercise period. Also, you will be able to rest assured that sufficient rest takes between each workout bout. For the man with limited training time and limited training energy, this type of routine may be just what the doctor ordered. In this situation, we would naturally place the most important movements first in our routine, in order that most of the energy can be spent on the movements which are the most important to us, with our particular training goals and endeavors. This does not mean that there will not be enough work for the rest of the body, for this is the beauty of such a scheduling of exercise periods. When you know that you will be training the entire body only two or three times per week, it is only natural that you wish to work very hard and completely an each and every exercise chosen for each and every exercise period. When you know that the workout of the day will be the only chance you will have to get to work the body for a few days, you will really try to get psyched up for the workout and this will help you to get the most out of each and every training routine. Some men cannot seem to keep up this amount of psyche for any length of time. For these men it would be wiser to work out more frequently but less intensely. But for the man who can gear up this extra emotionalism two or so times per week, this is the way to go. On the days you are not training, be sure to rest adequately and as completely as possible for this how you will be able to gear up for the next workout. Try to get in an occasional nap every so often to enable you to save necessary training energy. For let no one tell you differently: with this program you will have to work! This then, would be your whole body, twice per week specialization routine. Bench Press, Press Behind Neck, Bentover Barbell Rowing, Scott Curls Lying Triceps Extension, and Power Squat. With this workout you should perform the following set and repetition schedule for the majority of movements, except perhaps with your arm work, in which higher repetitions should be included. For the rest of the body, try to warm-up sufficiently with two of three sets of medium repetitions and then jump to a poundage you can handle for between six and ten repetitions and work with this weight for three to five sets. Cool down with two or so sets of somewhat lighter weights and somewhat higher repetitions. For the upper arms, I would recommend that the set scheme be somewhat reduced while the repetition scheme be increased so that you are handling weights for each set for between eight and twelve repetitions. After a two or three day rest, try to get in the following routine. This will be somewhat different from the first routine since you will be trying to work the muscles from a somewhat different angle. However, both routines will work the muscles most fully, completely, and adequately. Standing Press, Parallel Bar Dips, Lat Machine Pulldowns, Shoulder Shrugs, Cheating Barbell Curls, and Olympic Back Squat. For this workout, I would recommend a similar set and repetition schedule. Warm-up for the first two or so sets an then work into a weight you can handle for five to seven repetitions. Use this for four sets and then cool down with two sets of eight reps. The secret of properly working the body through these periods of super specialization lies within the mind and the integrity of the trainee. He must see to it that his diet is adequate and complete for the increase of workloads he will be undertaking. Also, in order for him to stimulate additional muscle growth, it will be necessary for him to face the fact that only through a great deal of self confidence and a strict adherence to the dietary principles discussed beforehand, will he succeed to the limit of his potential and physical capabilities. What I have tried to do in this chapter is to give you a selection of the most potent tools or weapons you will ever have at your disposal in the hopes that through the proper utilization of these techniques, you too will move one step closer to the goals of which your dreams are made . . .